A friend of mine suggested that I build something for a 74xx TTL discrete logic contest at dangerous prototypes, so I figured why not? If you like this design, make sure to leave a comment on their website for my competition entry. 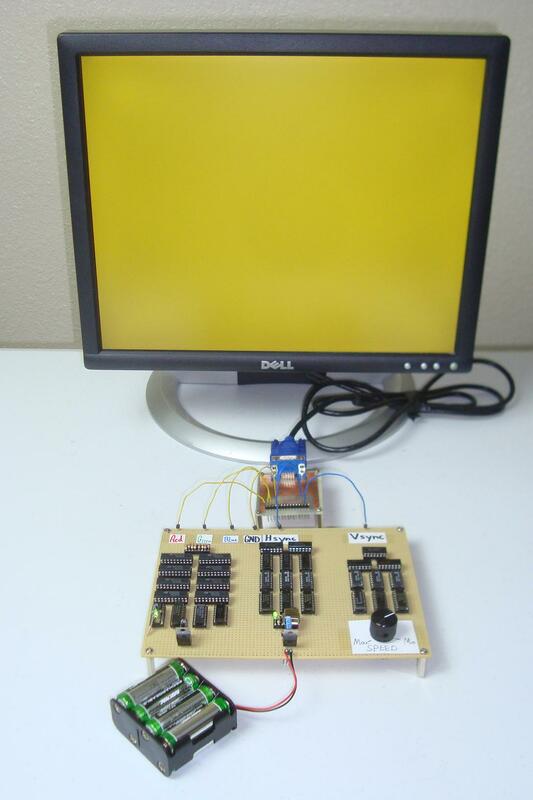 The Masochist's video card is a pure TTL discrete logic design that generates the necessary video signals for VGA. The project name came about after the hours I spent wire-wrapping the project together yielded painfully raw fingertips. So be fore-warned if you duplicate this project, don't abuse the wire-wrap tool! 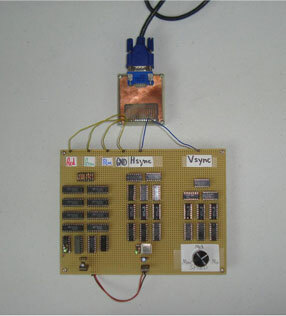 The Vertical and Horizontal sync pulses should be generated by using one or more binary counters with an input from a crystal oscillator for the clock. A state machine will have 8 colors hardwired into buffers so that each state displays the proper color pulses for the unique state output. The counters that we will use to generate Hsync and Vsync pulses will be 74-193 4-bit binary counters. An 8-input NAND Gate, 74-30 and some hex-inverters, 74-04, will be used to capture unique count values. Each value will have a unique function like, triggering hsync to begin or end, or clearing the count values.